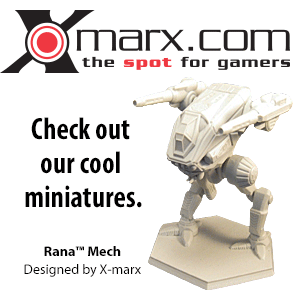 The Vindicator is one of the most well known Capellan Confederation BattleMechs. This workhorse of the CCAF was built in 2826 between the First and Second Succession War to maximize the effectiveness of the Confederation's production capabilities and fulfill as many roles as possible. Designed by committee, the Vindicator's "jack-of-all-trades" nature means it does not excel in any one role but fulfills them adequately. With almost all of its components produced on Capella, the Vindicator is also cheap, easy to mass produce, and quick to repair with a ready supply of spare parts. The 'Mech has a top speed of only 64.8 km/h, which allows it to keep up with most heavy 'Mechs and some slower medium 'Mechs. Four jump jets give it a jumping capability of up to 120 meters that, while not up to par with the greater distances of 'Mechs like the Phoenix Hawk, allows the Vindicator the ability to outmaneuver most heavier 'Mechs, as well as making it easier to traverse rough terrain. It also carries more armor than the Phoenix Hawk with good overall coverage, particularly on its rear torso and legs, making it better protected than smaller 'Mechs. Armament for the 'Mech is adequate though its primary weapons are unsuited for point blank ranges, while sixteen heat sinks help keep it cool. Unfortunately, early models of the Vindicator suffered from a design flaw wherein the head-mounted laser created a bulge in the cockpit. 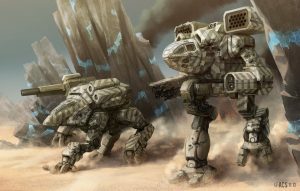 More than making the space cramped for tall MechWarriors, it also interfered with the ejection propulsion system, resulting in the deaths of a number of MechWarriors when their escape pods exploded during ejection. Engineers managed to redesign the cockpit layout prior to the War of 3039, eliminating the deadly intrusion and decreasing the chance of said unfortunate malfunction. Due to its relatively lackluster design and the outrageous mark-ups on spare parts sold to out-of-state parties, the Vindicator has remained almost exclusive to the Capellan Confederation since its introduction. Even in the wake of the Fourth Succession War, with a good portion of their military complex and resources gone, the Capellan leadership continued funding production of this 'Mech and updated it with the re-discovery of lostech. Following the introduction of the Firestarter OmniMech and its spread by the Second Star League production of the Vindicator was curtailed, though the line would be partially revived with a couple of specialized variants in 3060. The Vindicator carries as its primary weapon a Ceres Arms Smasher PPC in its right arm, giving the 'Mech a weapon capable of striking at long ranges and doing a respectable amount of damage. The weapon also features an innovative cooling jacket which possesses water intake ports around the muzzle, allowing the pilot to dip the PPC into a body of water and quickly cool it, with steam exiting via a nozzle at the opposite end. However this process leaves the Vindicator vulnerable as it must kneel motionless for ten seconds. As a secondary long-range weapon and giving the 'Mech indirect support capability is the Sian/Ceres Jaguar LRM-5, mounted on the 'Mechs left torso behind an armored door and supplied by one ton of ammunition. An extremely reliable system, the Jaguar can take quite a bit of abuse before it is shut down. Finally, for close range work, the Vindicator carries a head-mounted Ceres Arms Medium Laser and a Hessen IX Small Laser in its left arm. The Hessen laser was the result of the Confederation forcing Ceres to use at least one non-proprietary weapon system as a way of "stimulating domestic trade." Engineers had considered giving the Vindicator two PPCs but such a set-up would overburden its cooling system and leave it with no free hand to carry items. A Capellan experimental unit in 3071 based on the VND-3L, the cockpit weight is increased to 5.5 tons to accommodate the robotic drone control and the jump jets and the CASE in its right torso are removed. The left torso LRM 5 is replaced with 2 ER Medium Lasers, and the right torso ammo bin is replaced with an additional double heat sink. These 'Mechs were operated by an AI controller known as The Broken. BV (1.0) = ? ?, BV (2.0) = ?? The customized Vindicator used by Major Choung Vong in the Third and Fourth Succession Wars moved the head-mounted medium laser to the arm in place of the small laser, simply to make the cockpit roomier for its brutally effective but rather rotund pilot. BV (2.0) = 1,024. Snake - The Snake is a modified Vindicator designed specifically to counter Battle Armored troops. The Snake features an arm-mounted LB 10-X AC, and three Streak SRM-2s in the left torso.. BV (1.0) = ?, BV (2.0) = ? Capellan gladiators twin brothers Fuh Teng and Sze Teng piloted regularly Vindicator Battlemechs. In January of 3027, Philip Capet faced both in his Rifleman against them in the Steiner Stadium. He won the fight and killed Sze Teng in the process..
Candace Liao was a notable Vindicator pilot until she was severely wounded in a battle in Spica by Justin Xiang..